Skylark Blog: Starting the Divorce Process: Part 2 - Is there a Wrong Way to Start? There is no one-size fits all divorce process and for that reason there are a number of different ways to start a divorce in Massachusetts. This means that you have options! Unfortunately, that is not the same message you will hear from everyone, because who you ask this question to makes a difference in the answers you will receive. Most cases settle, even when they start in litigation. So why do more people start with litigation? You may have heard the story about the woman with back pain who asks her doctor what she should do. The doctor prescribes pain medication and exercise. She wants a second opinion so she visits a surgeon, and the surgeon recommends surgery. She's not ready for surgery so she seeks a third opinion from a chiropractor who tells her that all she needs is regular adjustments. Finally, when she complains to her therapist about not knowing what to do with these differing opinions, her therapist tells her the pain is in her head and she needs to focus on her therapy more. The cynic would say that each professional is just trying to bill a patient, but in reality professionals are all trained to see problems in light of the solutions they have learned to provide. The same is true for divorce professionals. Many people start with litigation because the first professional they ask about divorce is a litigation attorney. If you research online and stuck to the first few search results your will experience the same problem. At a recent presentation, Rackham Karlsson, a Massachusetts Collaborative Divorce Attorney and Mediator, pointed out that online resources tend to focus on only one option for starting a divorce: filing for divorce in court. The first three google results for "divorce in Massachusetts" (when searching in incognito mode to avoid my browsing history affecting the search) are: the Mass.gov Divorce site, the Mass Trial Court Law Library Divorce FAQ, and Mass Legal Help Basic Information about Divorce and Separation. 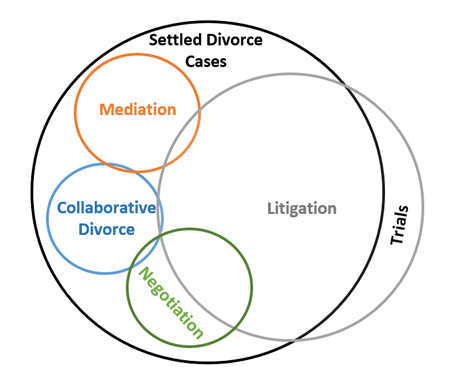 None of these sites mention mediation, mediators, arbitration, collaborative law or any alternative dispute resolution options. They all assume that when seeking divorce information you are ready to file with the court. These sites don't tell you how to get ready to file with the court, or when you should file with the court, leaving many people to believe that filing with the court is the first step. Before trial, either party may request that the court make temporary orders, for example concerning custody, child support, or visitation. Either party must request a pre-trial conference, and then there is a final hearing, the trial. The answer provided by Mass Legal Help is the answer to a completely different question: "How do I start a divorce after I have exhausted all options for reaching an agreement?" Filing with the Court should not be the first step in a divorce case unless there are emergency issues that cannot be resolved through agreement, such as when there is ongoing domestic violence or financial dishonesty. Even in cases where there is an emergency that requires going to court immediately, only a small percentage of cases go to trial. 95% of divorce cases settle. Before you start any divorce process, you should first ask yourself, what are my goals with the divorce. If most divorce cases settle, then how do you get to the best settlement in the most efficient way possible? 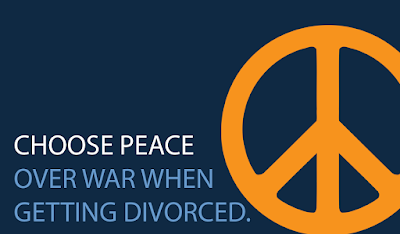 You find the divorce process that is right for you. In most cases, the out-of-court options available for starting a divorce will lead to faster, cheaper and less acrimonious resolution than going to court. There is a whole spectrum of options for getting divorced in Massachusetts and what you choose depends on how much help you want with all of the various issues involved in a divorce. We believe there is a right answer to the question "How do I start the divorce process?" The right answer should inform people of their right to go to court and of their right to settle outside of court. The right answer should highlight the various options available and the benefits of reaching agreement out of court. We have drafted the right answer in our previous post available here.